Always attention to detail, technical skills, passion in our work and great attention to customer needs are the strengths that have allowed us to excel in the field of sale of 8 printable cotton fabric Silhouette 21,6 x 27,9 cm - WHITE. Consultando il catalogo di Aerografando you will immediately notice how vast it is and how diversified the model range is PRINTABLE SHEETS, you will find the best 8 printable cotton fabric Silhouette 21,6 x 27,9 cm - WHITE offers at the best prices on all 8 printable cotton fabric Silhouette 21,6 x 27,9 cm - WHITE of the brands Silhouette America. Printable Cotton Fabric is a white cotton-based fabric that has a built-in backing. Though fabric usually requires a stabilizer to hold it in place to cut properly, this material's built-in backing means it's ready to cut without any further prep work. The backing also holds the fabric sheet firmly allowing you to send it through a printer to print custom patterns or images onto the surface. Now you can create your own customized fabric for any projects you'd like to make custom appliques. Simply print an image onto the Printable Cotton Fabric and then cut out around the contour using the Silhouette cutting machine's Print & Cut feature. The fabric backing can then be torn away leaving you with a custom cut-out printed piece of fabric that's ready to sew. Read the reviews of our customers on 8 printable cotton fabric Silhouette 21,6 x 27,9 cm - WHITE of the category PRINTABLE SHEETS. 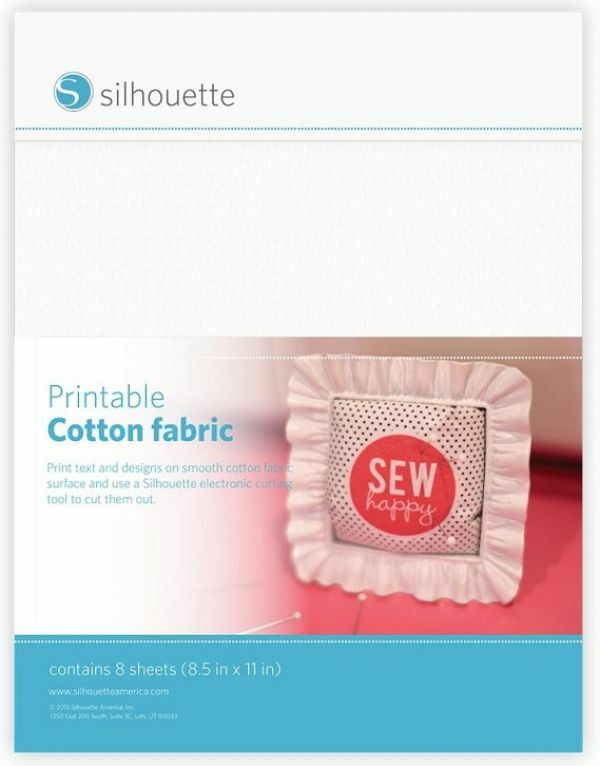 Review 8 printable cotton fabric Silhouette 21,6 x 27,9 cm - WHITE of the brand Silhouette America. Trust in the quality and professionalism of Aerografando on the sale of 8 printable cotton fabric Silhouette 21,6 x 27,9 cm - WHITE, only from us you will find the best prices. You want to have more details on 8 printable cotton fabric Silhouette 21,6 x 27,9 cm - WHITE MEDIACTNFAB or more generally on ours PRINTABLE SHEETS? You are looking for a PRINTABLE SHEETS but do not you find it in the catalog? Staff of Aerografando will answer all your requests.